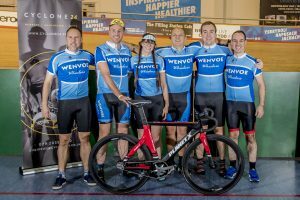 This month our rider interview comes from Rebecca Groves, who took part in our 2017 Newport challenge with her cycling club Wenvoe Wheelers. 2017 was a busy year for Rebecca, completing not only Cyclone24, but also Velothon Wales and Velo Birmingham and by taking on all these challenges managed to amass a fantastic fundraising total of £1,475.00 for her chosen charity, Alzheimer’s Society. That’s pedal power for you! We caught up with Rebecca after Cyclone24 Wales to find out her thoughts about taking part. How did you first find out about Cyclone24? Why did the challenge appeal to you? I decided to raise money in 2017 for Alzheimer’s Society as my Grandad suffers with the disease. I had already signed up for Velothon Wales and Velo Birmingham so decided to add Cyclone24 to the challenges! I had done a few track sessions before and really enjoyed them so thought it would be a good challenge to round off the year with. How did you prepare for the challenge? I have to say, I went in to it not feeling fully prepared as I hadn’t ridden much in the works prior to the challenge. The important prep of food supplies was coffee provision was in hand though! Having done quite a few track sessions, I knew I’d be able to cope with the riding, just wasn’t sure about the lack of sleep! What are your stand out memories from taking part? Great team spirit from our team! We really bonded over the event and ended up taking it a lot more seriously than we thought we would have when we first started. I think the final few hours were my favourite, the atmosphere and competitiveness was great! What was it like coming into the final few hours? What were your emotions? Our team were working really hard to climb as far up as the leader board as we could, which meant that lap by lap we were battling with one other team. We became super competitive towards the end which made it all the more exciting. I was also pretty relieved that I had finished my stint of cycling by 8am! The finish was so exciting, a great to see everyone back to life after the night shifts! What would your advice be to somebody thinking of doing the challenge for the first time? Definitely do it! I loved it, and it would be great to see more women involved! I would recommend having had a few sessions on the track before hand as it helps with riders confidence. What three words best sum up the Cyclone24 experience for you? We think Rebecca deserves a well earned rest over the Christmas period, but we have no doubt she’s already planned out her 2018 cycling calendar with more challenges!